Rooms, services Retro Merid Hotel Zamárdi is offering 16 tasfefully furnished, nice rooms for those looking for a place to stay at in Zamárdi. Services designed especially for small children ensure that the complete family will have a nice time at this hotel. The hotel has an own parking lot, enabling you to park your car on the spot for free. You won't have to worry about the heat, air-conditioners operating in some of the rooms will take care of a pleasant mood even during the hottest summer days (please check the information sheet of each room to see if air-conditioning is provided). If you have a suitable portable device, you can connect to the Internet via a wireless network (WiFi) available at the hotel. 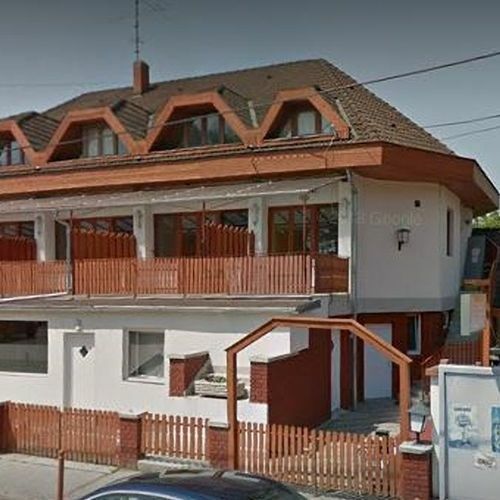 You can find the exact list of services provided by Retro Merid Hotel Zamárdi (including those for extra fees) and the exact equipment of the rooms on the information sheet below and on the information sheet of the respective rooms. Location The hotel is T-Beach public beach 2 km, Balaton Sound 1.2 km, Kőhegyi Lookout Tower 1.9 km, B my Lake 1.5 km, Red Bull Air Race 1.4 km, Strand Festival 1.4 km, Lugas Restaurant 1.5 km, Íves Terasz Diner 400 meters. Payment When paying your room, you may choose from the following payment methods: cash, debit/credit card, bank transfer. Retro Merid Hotel Zamárdi is asking for 30% advance payment. Arrival, opening hours The earliest time to check in at the hotel is 14:00, the latest time to check out is 10:00. The personnel speaks Hungarian, English and German.